Task 3: Identify the elements of property offences. 1. Theft Theft Act 1968 states that a person will be responsible of theft if he dishonestly appropriates property which is belonging to another with the purpose of permanently depriving the other of it. For Actus Reus related to theft it can be that if a person in a business steals company files without having permission to do so, this means that the person would be committing theft and for this reason they can be found guilty. For the Mens Rea of theft, the person must have been intended to steal something from the company such as the company files, this can be done due to get a member of staff in the company in trouble or to get them sacked. There was a case where a person was convicted of theft. D was a solicitor who transferred money from his clients' account to a higher account in an attempt to cover his personal debts. D was guilty since it was an illegal action to take. Fernandes, R v . 2: Obtaining property by deception Fraud Act 2006 states that you cannot gain property by giving incorrect information. For example a person who is working to care for an elderly or disabled person, but the person who is caring for them has access to the elderly or disabled person's bank account and misuses his position by transferring money to invest in a high-risk business of his own. The Mens Rea of obtaining property by deception is that the person who was caring for elderly or disabled person knew that it was illegal to have someone's bank details but still goes ahead and uses it for wrong purposes. 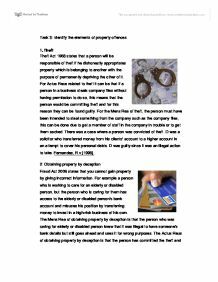 The Actus Reus of obtaining property by deception is that the person has committed the theft and should be found guilty of his actions. There was a case related to obtaining property by deception, this was where D sold a car by giving false number plates to V in return for a cheque of �165. ...read more. There was a case where D's automatic warning system was not working on a train which was travelling at 125mph from Swansea to London, due to this it crashed a freight train. 151 people were injured and several died. Furthermore �10 million worth of damage was caused. Great West Trains, R v . This is different compare to others because this offence can lead to businesses being punished and can be responsible for their actions. The company can also be convicted under the Corporate Manslaughter Act 2009 since the act is there to deal with crime that is committed by a company in relation to a work-related death. 2. Explain the meaning of corporate responsibility? This refers to the voluntary responsibility towards key stakeholders. It is measurable, but based on the company's objectives and values; it is also separated into social, economic and environmental responsibility. Businesses are motivated to become more socially responsible because their essential stakeholders wait for them to understand and address the social and community issues that are important to them. 3. Describe the actus reus and mens rea of corporate manslaughter? Actus reus The business was fined �60,000, and the company was each convicted of four counts of manslaughter. Kite was jailed for three Years. Jury verdict 10 to two. The four sixth-formers who died were Dean Sayer, 17, Simon Dunne 16, Claire Langley 16, and Rachel Walker 16. They were convicted of actus reus and mens rea. It can be convicted of Actus reus as it resulted in someone dying. Also it can be mens rea since people died because the health and safety measures were not met which led to people dying. Task 5: Identify the powers of the authorities to arrest, search and seize property in relation to a business. 1. Identify the following police powers with regards to businesses, stating the limits to these powers: Powers to arrest The police can stop and search a person in a business, but this can only be done if ...read more. * the place where the accident or dangerous incident has happened * the date and method by which the incident was first reported to the enforcing authorities VAT inspectors Any business registered to pay VAT will need to deal with a VAT inspection during the first three years of registration. But, overdue payers and payment defaulters would be visited more often. Any business registered with VAT will face regular inspections. The VAT inspectors will hold the examination at a business premises as they will want to ensure that they are being used, are fit, for business use and that they will want to be aware of how the business works. VAT inspections will want you to give a large number of business records and supporting documentations. Documents such as listed below are available for inspection: * sales invoices * delivery notes * import and export documentation * annual accounts * bank statements * till receipts Pollution inspectors The pollution inspectors examine the complaints about pollution from the business premises. They are in charge of enforcing the legislation and evaluating the environmental impacts of planning applications. They often go out to businesses and they carry out examinations they also ensure to see whether or not the businesses are obeying. At times the police officer issues and monitors authorisation for the business, which sets the limits for pollutants. Damages A person who is suffering from an injury in an accident is expected to have a legal entitlement to damages compensation. However if it can be proved that the accident was caused completely or partly by the carelessness of another person in the workplace. Financial loss Financial loss protects individuals and businesses against different financial risks. For example, a company might purchase cover to keep it from loss of sales. If a fire in a business prevented it from carrying out for a certain time. Insurance could also cover failure of a creditor to pay money that it owes to the insured. ...read more. Here you will be given your right to inform someone of your arrest; and your right to consult a solicitor in private and the fact that independent, legal advice is available free of charge. And your right to look at the police codes of practice. as substantially impaired his mental responsibility for his acts and omission in doing or being a party to the killing." The burden of proving Diminished Responsibility is on the defendant, unlike other defences; this is because everybody is presumed to be sane unless proven otherwise. It is seen as unjust that such a person is found guilty of the same crime of murder and sentenced to the same punishment. The actus reus of murder involves the death of a "person in being", and excludes the death of a foetus. Assault and Battery are classed as offences of basic intent, which means that if the defendant is intoxicated when doing the actus reus, he is considered as doing it recklessly, as stated by the House of Lords in DPP v Majewski (1976). This was seen in the case of Thomas (1985). To determine the mens rea for a Battery, all the defendant needs to have is the intention. I am now going to look at whether Ann, should be guilty of ABH or GBH for the injuries to Ben. Ben was hit in the face by Ann, whilst she was holding a glass. Public place not only means in the street but also extends to places such as car parks and even private gardens. If an officer wants to stop and search they must advise (these are safe guards) - * The law under which they are stopping or searching you. which may be harmful to himself or to others, or may cause physical injury or maybe hiding something which is illegal to carry like a class a drug which he might be importing or exporting. The Terrorism act 2010 allows searches because it is believed to be a convenient method for anti-terrorism.